"No boiling and peeling potatoes or adding mayo with this recipe. Great summer recipe. Enjoy!" Place potatoes in a bowl; add 2 tablespoons olive oil and toss to coat. Cook on preheated grill until tender, about 30 minutes. Cool potatoes, 10 to 15 minutes; cut into quarters. Whisk 1/2 cup olive oil, vinegar, salt, black pepper, garlic, and sugar together in a bowl until dressing is smooth. 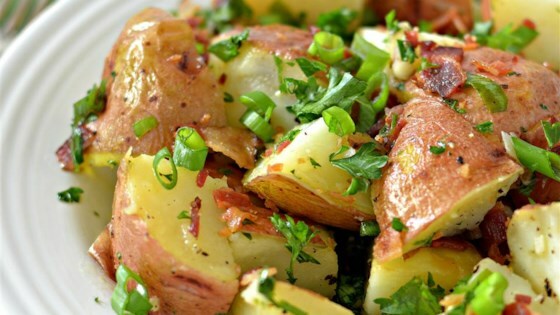 Toss potatoes, bacon, green onions, and parsley with dressing in a bowl until evenly coated. It even gets better sitting under the sun! Absolutely perfect for summertime grilling. This easy to make 5 star recipe was a hit here during a BBQ without heating up the kitchen. The only change I would make is to double up on the bacon. I expected to like this after reading reviews, and the fact that we love most salads with oil/vinegar based dressings. We did not care for the flavor of this at all. So delicious!! Used a little less olive oil and salt due to the bacon. Grilling the potatoes will be my go to for any potato dish. I ended up doubling all ingredients in the dressing save the oil and adding 1 tablespoon Dijon mustard. Light, tasty and healthy. Works well warm, cold or hot. Amazing! I used white wine vinegar and forgot the sugar, and it was delicious!!! New favorite grilling recipe!